She and her parents and four younger siblings took three plane rides to reach Bowling Green, Kentucky. This was the family’s first time on a plane, and they had to sit separately on all three flights. On the first flight, Senida distinctly remembers her ears hurting and crying from feeling overwhelmed by the strange experience. Later on another flight, Senida sat next to a woman who described Kentucky to her as very green and with lots of horses. Senida remembers the anxiety among her family as they traveled to a new continent, leaving behind the only life they knew in Bosnia and Herzegovina. “We didn’t know where we were going, what to expect,” Senida said. The Husi?s among thousands of Bosnians who came to Bowling Green after fleeing the Bosnian War. The war was fueled by Bosnian Serbs who attempted to ethnically cleanse the country of Bosniaks, according to an article from History.com. About 100,000 died from the war and genocide. Bowling Green today has nearly 6,000 Bosnians, according to Kentucky Folklife Program’s director Brent Bjorkman. Their presence is large as they make up about 10 percent of the city’s population. Senida and her family’s life looks very different than it did almost 20 years ago when they arrived to Bowling Green as refugees. The hardships the now 31-year-old faced as a preteen have shaped her into the person she is today. Before the war broke out, Senida and her family lived in the countryside outside of Bratunac. Her father, Senahid, was a machine technician while his wife, Hajrija, helped care for their farm land. Senida puts food on her father’s plate while she and some of her family members have a quick lunch together. Now that Senida’s parents cannot work anymore due to being physically disabled, she provides a lot of financial support along with her other siblings as well. “We had a good life,” Senahid recalled. Back in Bosnia, Senahid and Hajrija were in the middle of building their new house when the Bosnian Serb forces moved into the town. The Husi?s left their home before the Serb forces shelled it and set it on fire. The Husi?s fled several times to different parts of Bosnia to avoid being killed. In Croatia, the family waited three to four months until they were allowed to emigrate to the United States in 1998. When they reached Bowling Green, Senida’s parents had to find jobs immediately in order to start supporting their family of seven and also to pay back the plane tickets provided by the refugee center in Bosnia. That left Senida alone to care for her four younger siblings. While Senahid and Hajrija worked third shift at their assembly factory jobs making minimum wage, Senida was getting dinner started for her and her siblings and helping them with their homework. “I felt like I had to grow up pretty fast,” Senida said. 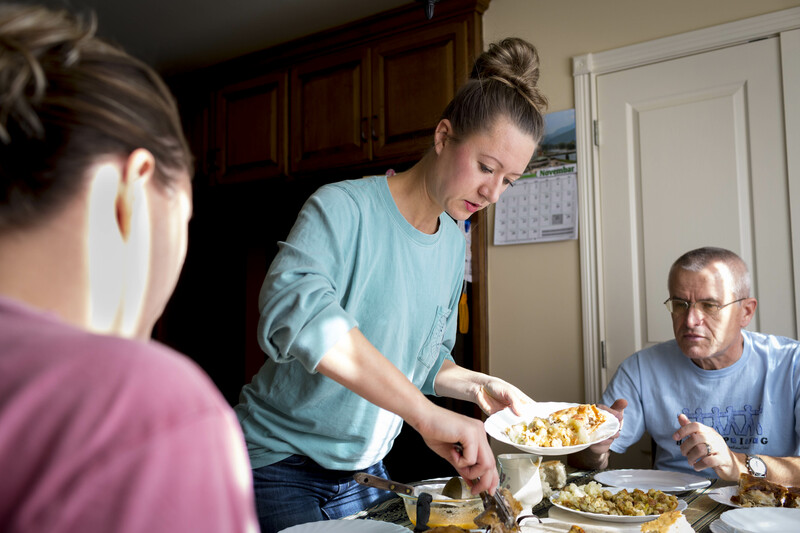 Around 6 a.m., she would wake up her younger siblings and get them ready for school. From the public housing complex, where she and her family lived at the time, she would walk her siblings to Parker-Bennett-Curry Elementary School. Between work and English classes, Senahid had little time to spend with his children growing up. But he has confidence that his daughter took good care of her siblings. “I know she did hard work,” her father, Senahid, said. Sabina Husi? the next eldest sibling, remembers Senida getting worried and upset when she would stay out past dark playing with her friends. Now as adults, Sabina sees Senida as a role model. She gives confidence and approval to Sabina, a quality that is special to their relationship. When Sabina was unsure if she should move to Louisville to pursue a career in human rights, she went to Senida and asked for advice; Senida encouraged her to make the move. Sabina found an apartment to live in later that day after talking to her sister. “All it took for me to actually put one foot in front of the other was for her to say, ‘I think you should do it,’ because then that just gave me, like, courage to do be able to do it,” Sabina said. The hardships Senida faced after coming to Bowling Green have shaped her into someone who puts her family above herself. Although her siblings equally care for their parents, Senida offers most of the financial support now that they are disabled and cannot work. After spending a year in Carbondale, Illinois working at a clothing store, Senida moved back to Bowling Green and bought a house in a nice neighborhood for her family to live in. The family decided to live together for practical purposes and to be closer to one another. She has lived with her parents and siblings for over two years now. However, in the next few months Senida plans to marry her fiancé and move to Nashville. Despite the uncertainties, she is eager to take the next step in her life. Sometimes she puts too her much on her plate due to having a large family, but the support she gets from them outweighs the feeling of seemingly constant stress. “I feel like if they weren’t there for me…I would feel so much more overwhelmed and stressed by myself,” Senida said. Senida hopes that she will always be there for her family no matter where life takes her. Senida (right) and her mother, Hajrija Husi? (left), eat lunch with their other family members. Although Senida’s family doesn’t have time to eat meals together as much as they used to, they still try to make time to be with each other.